with optional lower and upper bounds lb and ub on the components of x.
x, lb, and ub can be vectors or matrices; see Matrix Arguments. x = lsqnonlin(fun,x0,lb,ub) defines a set of lower and upper bounds on the design variables in x, so that the solution is always in the range lb ≤ x ≤ ub. You can fix the solution component x(i) by specifying lb(i) = ub(i). x = lsqnonlin(fun,x0,lb,ub,options) minimizes with the optimization options specified in options. Use optimoptions to set these options. Pass empty matrices for lb and ub if no bounds exist. x = lsqnonlin(problem) finds the minimum for problem, where problem is a structure described in Input Arguments. Create the problem structure by exporting a problem from Optimization app, as described in Exporting Your Work. [x,resnorm] = lsqnonlin(___), for any input arguments, returns the value of the squared 2-norm of the residual at x: sum(fun(x).^2). [x,resnorm,residual,exitflag,output] = lsqnonlin(___) additionally returns the value of the residual fun(x) at the solution x, a value exitflag that describes the exit condition, and a structure output that contains information about the optimization process. [x,resnorm,residual,exitflag,output,lambda,jacobian] = lsqnonlin(___) additionally returns a structure lambda whose fields contain the Lagrange multipliers at the solution x, and the Jacobian of fun at the solution x. 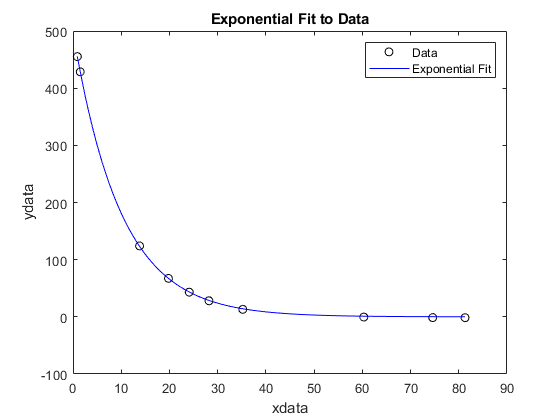 Fit a simple exponential decay curve to data. The problem is: given the data (d, y), find the exponential decay rate that best fits the data. Create an anonymous function that takes a value of the exponential decay rate r and returns a vector of differences from the model with that decay rate and the data. 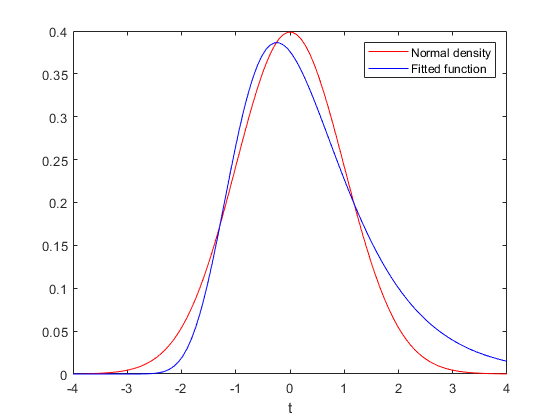 Find the value of the optimal decay rate. Arbitrarily choose an initial guess x0 = 4. Plot the data and the best-fitting exponential curve. Find the best-fitting model when some of the fitting parameters have bounds. Create a vector t of data points, and the corresponding normal density at those points. Create a function that evaluates the difference between the centered and scaled function from the normal y, with x(1) as the scaling a and x(2) as the centering b. Find the optimal fit starting from x0 = [1/2,0], with the scaling a between 1/2 and 3/2, and the centering b between -1 and 3. Plot the two functions to see the quality of the fit. 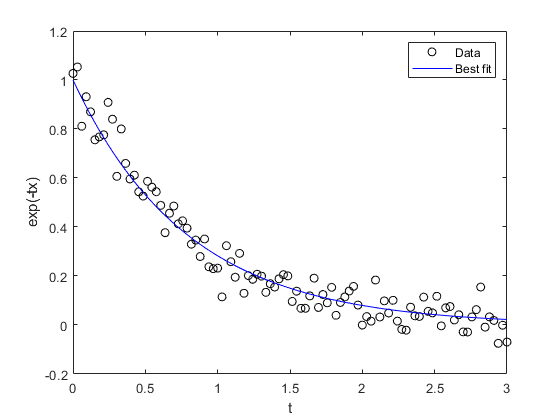 Compare the results of a data-fitting problem when using different lsqnonlin algorithms. Create a simple exponential decay model. The model computes a vector of differences between predicted values and observed values. Fit the model using the starting point x0 = [100,-1]. First, use the default 'trust-region-reflective' algorithm. See if there is any difference using the 'levenberg-marquardt algorithm. The two algorithms found the same solution. Plot the solution and the data. and find the value of the minimal sum of squares. for k = 1 to 10 (that is, F should have 10 components). First, write a file to compute the 10-component vector F.
Find the minimizing point and the minimum value, starting at the point x0 = [0.3,0.4]. Examine the solution process both as it occurs (by setting the Display option to 'iter') and afterward (by examining the output structure). Fit the model using the starting point x0 = [100,-1]. Examine the solution process by setting the Display option to 'iter'. Obtain an output structure to obtain more information about the solution process. Examine the output structure to obtain more information about the solution process. For comparison, set the Algorithm option to 'levenberg-marquardt'. The sum of squares should not be formed explicitly. Instead, your function should return a vector of function values. See Examples. You must supply at least the objective, x0, solver, and options fields in the problem structure. Squared norm of the residual, returned as a nonnegative real. resnorm is the squared 2-norm of the residual at x: sum(fun(x).^2). Value of objective function at solution, returned as an array. In general, residual = fun(x). The trust-region-reflective algorithm does not solve underdetermined systems; it requires that the number of equations, i.e., the row dimension of F, be at least as great as the number of variables. In the underdetermined case, lsqnonlin uses the Levenberg-Marquardt algorithm. Since the trust-region-reflective algorithm does not handle underdetermined systems and the Levenberg-Marquardt does not handle bound constraints, problems that have both of these characteristics cannot be solved by lsqnonlin. lsqnonlin can solve complex-valued problems directly with the levenberg-marquardt algorithm. However, this algorithm does not accept bound constraints. For a complex problem with bound constraints, split the variables into real and imaginary parts, and use the trust-region-reflective algorithm. See Fit a Model to Complex-Valued Data. If components of x have no upper (or lower) bounds, lsqnonlin prefers that the corresponding components of ub (or lb) be set to inf (or -inf for lower bounds) as opposed to an arbitrary but very large positive (or negative for lower bounds) number.